This weekend a friend showed me the work of Eric Cahan; on the left is one of his series of photographs of sunsets. They’re a beautiful source of inspiration for all of your ombré beauty jams - hair tips, nails, eyeshadow - and you can see them all here. The nails are by Madeline Poole for Nailing Hollywood, and you can read about her technique here. 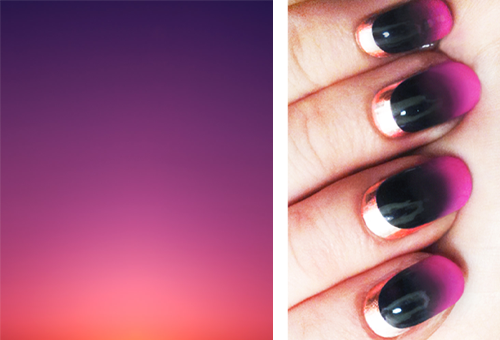 Have you tried an ombré nail? Did you pull it off? Any tips?